Happy New Year and welcome to the first post about the York: Gateway to History Heritage Lottery Funded project. 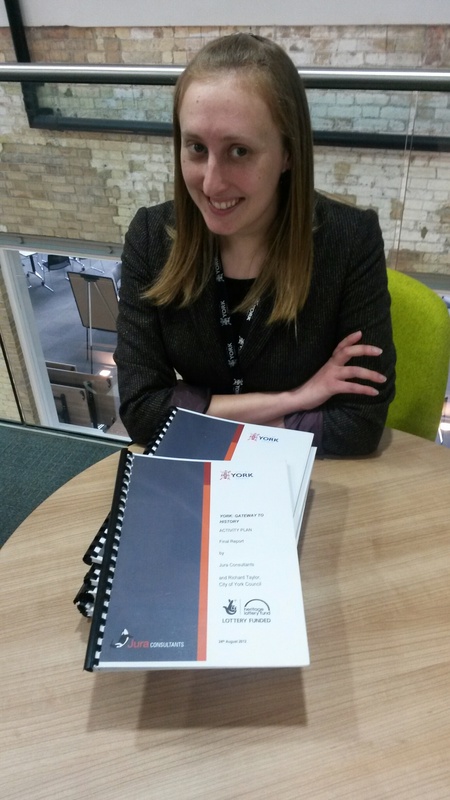 I’m Sarah, the newest member of the team, working as Community Collections & Outreach Archivist. I’m responsible for building connections with community groups across the city and supporting these groups in the creation, storage and celebration of their archive collections and heritage. To improve access to the collections I’m also going to be working on the currently un-catalogued non-civic archive collections. As with Justine’s York: A City Making History project, I’ll also be using MPLP to gain greater intellectual control over the collections, to make them more accessible to new researchers. So, what can you expect from my posts over the next 2 years? Well, I’ll be keeping you updated with both the cataloguing and outreach elements to the project with some relevant theoretical discussion thrown in! I’m also keen to include some guest blog posts, hopefully from some of our newly formed community links as it’s a great chance to share some different perspectives on the project from across the city. I’ll be giving you regular updates on this project through this blog but also through our Facebook and Twitter pages. You can also tweet about us using the hash tag #gatewaytohistory. So get involved and send us your comments and we hope you’ll be as excited about this project as we are!